When you need bees removed, let the professionals with safety gear and experience perform your bee removal service. For the vast majority of us, if an insect is yellow and black with a stinger, then it is a bee! Most of us don’t want to take the time or the interest to find out if the insect swarming our picnic is a bee, wasp or hornet — we just want it gone! That is where we come in. Here at Florida Bee Removal, we consider it part of our job to know the differences between the different types of bees and how to identify them because it makes our bee removal service that much more effective. 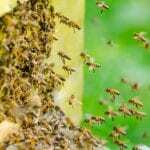 When you call Florida Bee Removal for bee removal service, you can feel confident that this is one problem that can be taken care of effectively. While you sometimes need to spray many times before the spiders or cockroaches get the hint, we can perform bee removal service, relocate the bees, and clean the area that contained the hive well enough that the bees won’t be tempted to return and rebuild. Our bee removal service has been fine-tuned and honed over decades of experience so you can feel confident and secure that calling us for bee removal service means that your bees will be removed! We are professionals here at Florida Bee Removal, and we urge you to leave bee removal services to professionals. Even though bees are small insects individually, most of them are quick to anger and will not hesitate to defend themselves with their most obvious weapon — their stingers. They also communicate well with one another and can call for reinforcements at any time. When it comes to bee removal services, we have knowledge and equipment that keeps us safe! For questions or to make an appointment for bee removal services in Lakeland, Florida, call us today!